Shopping for Nightmare Before Christmas Mini-Figures? The Nightmare Before Christmas gets miniaturized and stylized! Awesome stylized vinyl mini-figures from Tim Burton's hit animated film. Collect all of the 2 1/2-inch mini-figures! Tim Burton's hit animated film The Nightmare Before Christmas gets stylized and miniaturized! 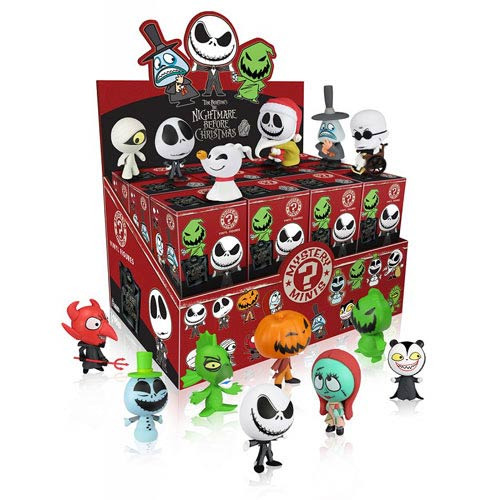 The Nightmare Before Christmas Mystery Minis Display Box features all of your favorite characters from the film as 2 1/2-inch tall stylized vinyl mini-figures. You'll get Jack Skellington, Sally, Oogie Boogie, the Mayor, and so many more! This Display Box case contains 24 individually packaged blind box figures (subject to change). Note: The figures in this case are blind packaged. We cannot accept requests for specific figures, nor can we take returns on opened packages. You will receive duplicate figures. Ages 3 and up.